Good morning from my desk in the FoxCT/Hartford Courant newsroom, aka Connecticut’s Newsroom. It’s thinned out as you might expect at 2:00 AM, but we’re still staffed. This is the calm before the storm. It’s been over a week since I first ‘met’ Sandy. She was just a cluster of thunderstorms south of Jamaica back then. Why she immediately drew interest within the meteorological community isn’t clear, but we all followed her… or pre-her. Nearly a week and a half ago the ECMWF model predicted landfall on the US East Coast. Crazy talk! It was a path storms never take&#185. And yet as we all watched the ECMWF held true. Sure the exact spot changed by a few hundred miles, but the overall prediction was incredible from that time and distance away. 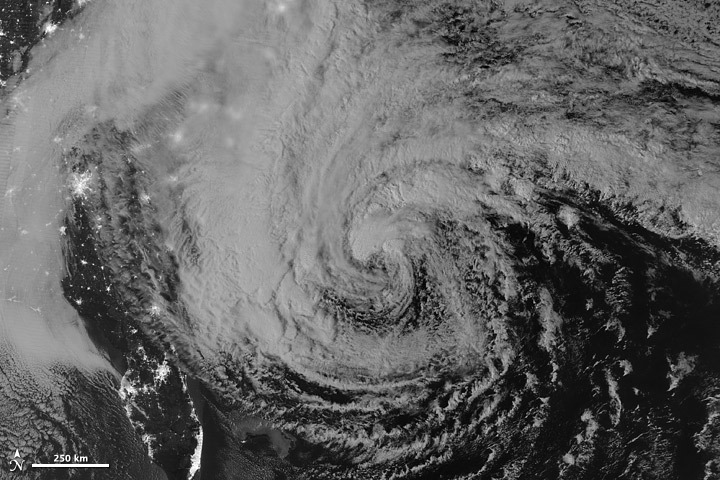 This morning Hurricane Sandy is over 400 miles south of Connecticut with top sustained winds of 75 mph. We’re beginning to feel some of its wind. We’re still hours away from tropical storm force gusts. The latest run of the SLOSH model, the storm tide predictor, shows slightly lower high tides on the Connecticut shoreline. It’s probably because Sandy will make landfall a little earlier than expected which moves the highest surge farther out of alignment with the highest tide. Severe flooding, especially in the New Haven area and west is still likely. Moderate to severe flooding will be the case east of the New Haven metro. The rest of the state should see tropical storm and occasionally hurricane force gusts from late afternoon through late evening before tapering off. Trees, tree limbs and power lines will surely come down. How many? Tough to say. We’ll get a better understanding of how well the power companies have mended their ways by Tuesday. There will be a lot of rain, but not for us. A few inches sure, but farther south they’ll see multiples of that. Inland flooding in Connecticut will be limited. Stay safe. Think before you act. If asked to evacuate, please do so. &#185 – For years I had a theory that a direct hurricane strike was nearly impossible because the storm would have to hug the Jersey coast. I never once considered a storm coming in from the southeast. We have endured many a storm. Us Yankees can endure this too. We will make it. Geoff: I hope that, in a strange way, that Megastorm Sandy serves as vindication for meteorologists and forecasters everywhere! For the first time that I can remember (and I’ve followed weather events for nearly 40 years), this forecast was spot-on at least five or 6 days out, right down to the transition from tropical to non-tropical. I agree that the NHC did the public a disservice by not flying HURRICANE WARNINGS, knowing what was coming. Not as bad of a disservice as that of the weather service to our ancestors in 1938, but a bad call nonetheless. Moved away a decade ago, but today I was glued to the live streaming provided online to see what was going on at “home”. Thank you for a great job. Geoff, I hope you’re okay since I haven’t seen any updates from you since this one. I’m stranded in San Diego until the end of the week since they canceled my flight home last Sunday so I haven’t been able to watch the news (apparently, we didn’t lose power OR all our cable at home in Brooklyn, CT). Geoff, did you stress the storm surge enough before hand? Isaac [cat 1] had a storm surge of 8.5 ft and Sandy [cat 1] although wider had a surge of 13.5 ft.. this is not usual in the usual cycle of earths history. What’s changed?